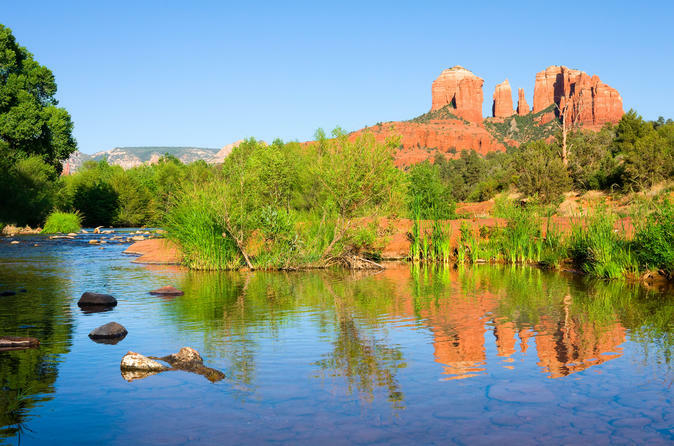 On this 3-day, 2-night tour of Sedona and the Grand Canyon, you'll travel through the Sonoran Desert to Sedona before exploring scenic Oak Creek Canyon and admire the ever-changing colors of the Grand Canyon. Please limit luggage to carry-on size only. Any bags larger than 9" x 14" x 22" should be left with your hotel. Travel through the Sonoran Desert to the red rock country of Sedona. You will have the afternoon and evening free to enjoy many Southwestern art galleries and unique shops. In addition, you can choose either a 2.5-hour scenic and historical tour or a wilderness jeep excursion. Many hiking trails are also nearby. This morning your guide will meet you at your hotel to begin your tour through scenic Oak Creek Canyon. You'll arrive at the Grand Canyon Village around noon for your first dramatic view. Rooms will not be ready for occupancy until later in the afternoon, so your guide will present various options for you to enjoy. You have the afternoon free to hike, take an optional scenic air tour over the Canyon, spend time at the Visitor Center or just enjoy the views of the ever-changing colors of the Canyon. This morning you have free time to watch the sunrise over the Canyon, walk along the rim out to Yavapai Museum, or just enjoy the views. The early afternoon you are free to explore. You can add an optional helicopter tour or take advantage of the West Rim shuttle (seasonal) to enjoy other views of Grand Canyon. Return to Phoenix mid to late evening. Please note: The price displayed is based on 4 people in a single reservation. If you require separate rooms you must make separate reservations. There is a maximum of 4 people per room. Please note, Luggage Policy ~ One standard size carry-on (9”x14”x22”) and one personal item (ex. purse or camera bag) per person ONLY. This policy is strictly enforced. Space is at a premium for guest comfort. Extra luggage cannot be transported.